The Solstice has passed, so days will gradually be getting longer. It’s one step closer to spring! I’m always amazed that early mankind noticed that on this day, the days begin to lengthen again. How did they know, without clocks or scientific measurements? After weeks of fearing the sun was disappearing, they rejoiced that the sun was returning. Many of those pre-Christian ways of celebrating this important event were later incorporated into the Christmas season, just as many of the plants used in their celebrations have been included. In decorations, foods, drinks, candles, potpourri, sweet bags and more, herbs have always been an important part of the holidays. Holly, ivy, mistletoe, juniper, pine, rosemary, lavender, thyme and mints are just a few of the traditional herbs used to celebrate this special time. I hope you are enjoying the fragrance and flavors from your herb garden this time of year as much as I am. 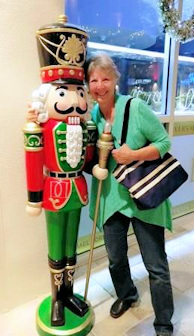 “Victorian Holiday Christmas Exhibit”: now through Jan. 6 at the Fort Wayne Botanical Conservatory, 1100 Calhoun St. Tuesdays through Saturdays, 10-5.Thursdays 10-8 (outdoor evening light show with synchronized music!) and Sundays noon-4pm. 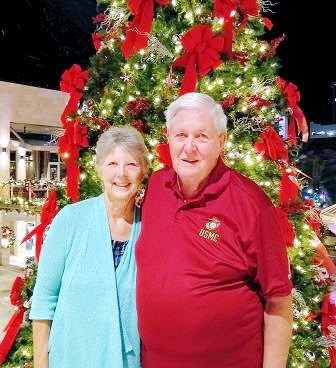 Be sure to visit their outstanding gift shop, too! Valparaiso Garden Show: will not be held in 2019, but look for it again in January, 2020! Indiana Hort Congress: Feb. 12-14. This is a good show, although much smaller than the one above, for anyone involved in farm markets or commercial crop production, wine, agri-tourism, food safety, and organic or greenhouse growing. Attend the entire conference, or go for 1 day. The trade show is worth seeing for packaging, production machinery, wholesale seeds, irrigation equipment, etc. Schedule and registration available at www.inhortcongress.org. Held at Indy Marriott East. Fort Wayne Home & Garden Show: Feb. 28-Mar. 3. Held at the Coliseum. Visit their website to get a $2.00 off admission coupon. It’s also a good time to take a walk around all the gardens, looking for fences that need to be repaired, supports that need to be added or replaced, plants that may have heaved up during that last really cold spell, or mulch that may have been washed away during the heavy rain last week. Keep the gardens tidy, so that when those first bulbs push through the soil you can enjoy their beauty without the competition of toppled brown stalks of perennials. Speaking of bulbs, stock up on deer and rabbit repellents now so at the first sign of damage spraying can begin. Nothing is sadder than having the bulbs you planted so carefully last fall being devoured before they have a chance to bloom! It may be a good time to build a cold frame, or make hoops for covering early spring crops, or to read about berry growing, or clean the greenhouse, or sterilize seeding flats. Set-up seed starting areas early, and bring a bag of soil inside so it will be thawed and ready to use when you are ready to seed. Remember, thankfully, every day is getting a bit longer and the garden season will soon begin. 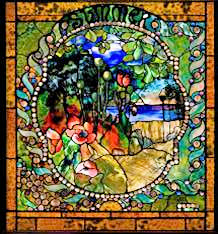 I fell in love with Susan Vreeland’s book “Clara and Mr. Tiffany,” which relates the story of Clara Driscoll, who many are convinced invented the famous “Tiffany” lamps. There is no doubt that she designed most of the floral-themed lamps. After reading the book, I made it a point to visit the wonderful Morse Museum in Winter Park, FL. 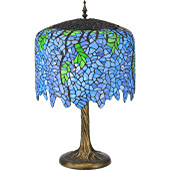 to see some of her most famous creations, especially the lovely Wisteria lamp that contains 3,000 pieces of glass the size of one’s fingernail! Do read the book before you go, because your appreciation of the work involved, and the historical significance will be dramatically enhanced. 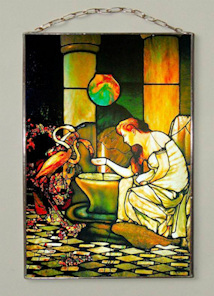 In addition to the lamps, there are several large panels and windows, for which Louis Comfort Tiffany was famous. It was difficult to take good photos, but here is a bit of the six fabulous wisteria panels that graced Tiffany’s dining room. In addition to the lamps and the iridescent pottery on display, there are several pieces of furniture, Tiffany works, and bits of architecture salvaged from his ornate mansion of eighty-four rooms, Laurelton Hall. My favorite was the Daffodil Terrace with its stained glass daffodil topped pillars. However, the Reception Hall, Dining Room, and Living Room (which contains the famous “Maiden Feeding Flamingos” window and also the equally famous “Four Seasons” panels are displayed) are equally impressive. Unfortunately, the home burned. There are also paintings and other objects d’art, and detailed brochures that give information on each item in the various rooms. The museum offers various lecture series and special exhibits, as well as special family night events. Do visit if you are in the area! 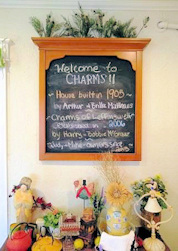 I can’t pass a tea room without stopping for afternoon tea, and this quaint little tea room “Charms of Leffingwell” in Ellenton, Florida (just off I-75) was a pleasant place to indulge. Open only Saturdays and Sundays 10am-3pm, we were fortunate to be able to work it into our schedule. Downstairs, the rooms are filled with an assortment of tables and chairs and a jumble of antiques. 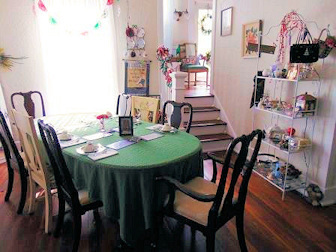 Upstairs is entirely filled with antiques, used books and various other items for sale. I came away with a lovely used book “Romancing Miss Bronte,” which was delightful reading. 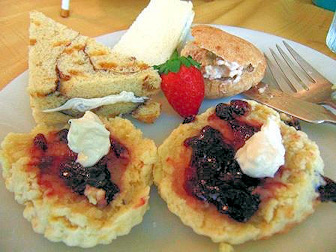 The food was more than adequate, with four varieties of finger sandwiches plus scones with clotted cream and jam. 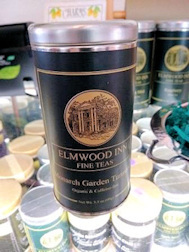 I chose the Elmwood “Monarch Garden Tumeric” tea which was delicious. 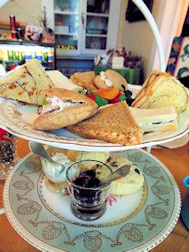 If you are in the area, and want a quiet place for tea, be sure to visit! Legend tells that on the night of Christ’s birth, Mary laid her blue cloak over the branches of a rosemary bush. 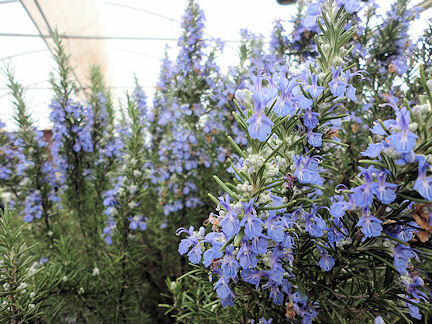 Rosemary commonly grew in the region, a shrubby plant with evergreen needles and white blooms. Because of its wonderful fragrance and insect repelling qualities, women often hung their laundry on rosemary shrubs to dry. But on this special night, the rosemary was blessed. Since then, rosemary has a blue flower that matches Mary’s cloak. This is only one of the many stories linked with rosemary.Throughout the ages, this herb has earned a reputation for special powers. Its clean, potent fragrance was thought to cleanse the air of diseases, so sprigs were often strewn or burnt in the sickroom, or carried at funerals. Many also believed rosemary could ward off evil spirits and that placing sprigs under pillows could prevent nightmares. Because the flavor and fragrance of rosemary is so lasting, even when dried, it was said to have the power to bring back energy, memories, and even to help raise the dead. It was a symbol of lasting friendship. Rosemary is included in bridal bouquets to symbolize enduring remembrances. Rosemary is a must for any herb garden, or for anyone who wants to cook. Its flavor goes well with fruits, wines, roasted vegetables, meats, and breads. It is especially good with lamb, and stems are often used as skewers for grilling meats or vegetables. It is also used in teas or lemonades. mixtures, and soaps. It’s an especially good hair rinse for those with dark hair. well-drained soil, plenty of lime, and frequent watering. It cannot survive a temperature below twenty degrees for extended periods. Where winters are cold, it should be grown in pots and moved indoors. Inside, it requires a sunny window and frequent misting, and a soil that is constantly a bit moist, but never let it stand in water. Combine in medium heavy saucepan with lid: 1 apple, diced; 1 c. etc.) ½ c. apple cider or apple juice or cranberry juice; ¼ c. red wine, (cranberry or apple juice may be substituted); 3T. 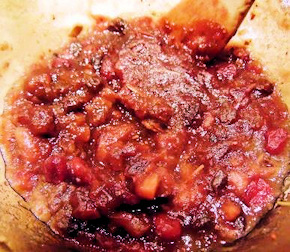 sweet pickle relish; ½ tsp. dried rosemary. Cover. 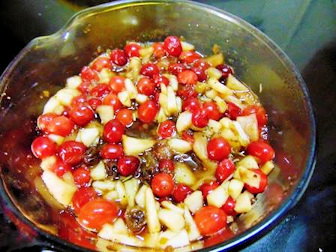 Simmer gently on medium-low heat for about 1 hr, stirring occasionally, until all moisture is absorbed and fruit is soft. 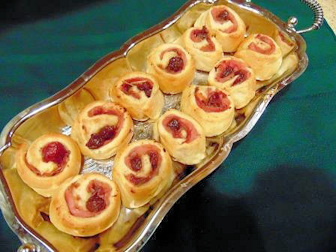 Serve on Melba toast, toasted mini-bagels,or make the pretty spirals below. It’s also good as an accompaniment to meat or poultry. Purchase 8 oz. thinly sliced ham. Try to get rectangles about 4” x 6”. Open an 8-oz. 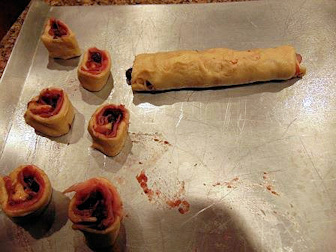 package crescent rolls. Press two triangles together to form a rectangle. Spread with cranberry chutney. Place a slice of ham on each. Roll to form a 6” log. Cut each log into 6 pieces. Place on baking sheet that has been lightly sprayed with oil. Bake at 375 degrees just until rolls are beginning to brown. Serve warm.